A Plasma TV screen is above the fireplace in the two story living room to set a relaxing mood for entertainment with the latest in technology. In addition to the cable TV, you also have a DVD player and a library of DVD’s to choose from. Wireless Internet Access is free throughout the house and yard. 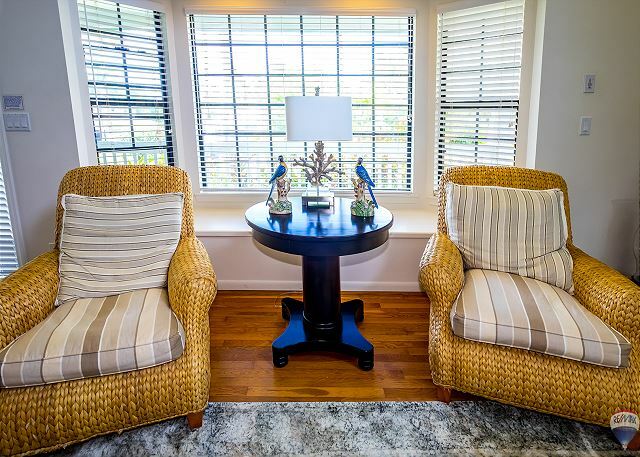 There is also wired internet access in the upstairs study that overlooks the blue Pacific. The view will help you compose email or letters while seated at the bamboo desk. It’s very relaxing to watch the ocean from here. Though my favorite view is of the Na Pali mountains and the peak called Bali Hai. So named because of the movie South Pacific. 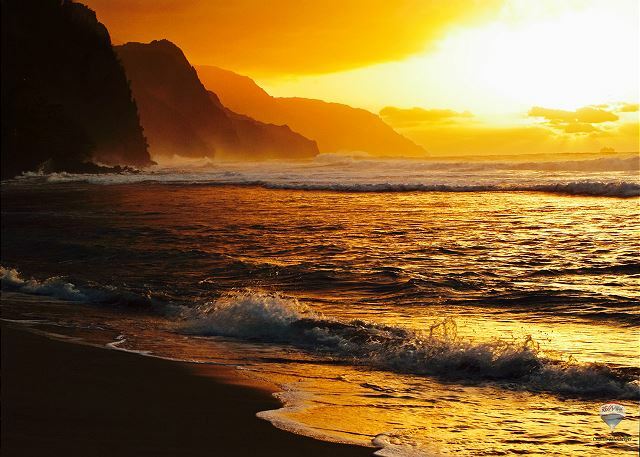 As a guest at Hale Kohea & RE/MAX Kauai, you'll have access to Kauai's Premier Concierge Service at (855) 665-2824 or visit http://kauaiva.com/index.html we will help you build your perfect vacation. The house and neighborhood were wonderful. The master bed was very comfy and we slept very well. The couch in the living room needs a new cover, but was also comfortable. The view of the mountains in the back yard on clear days were Amazing: you could see waterfalls coming down from them. Very close to store and a few restaurants for food. We were sad that the prior flooding kept the beaches past Hanalei closed during our stay, however, there is no shortage of other beaches to explore on the other sides of the island. We would highly recommend this house to family and friends. We had an amazing stay at Hale Kohea! 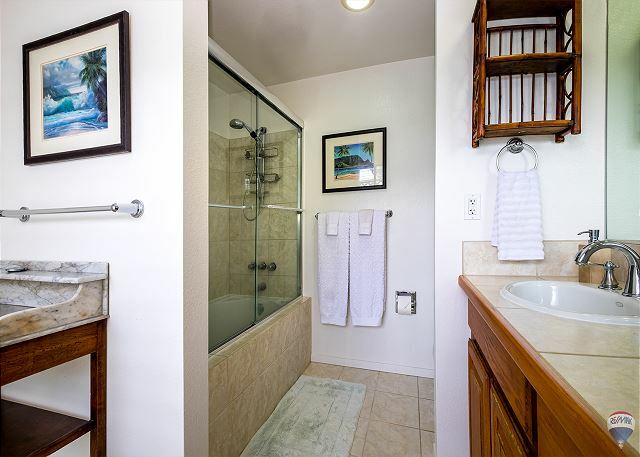 Such a cute and accommodating home that is super close to Hanalei! 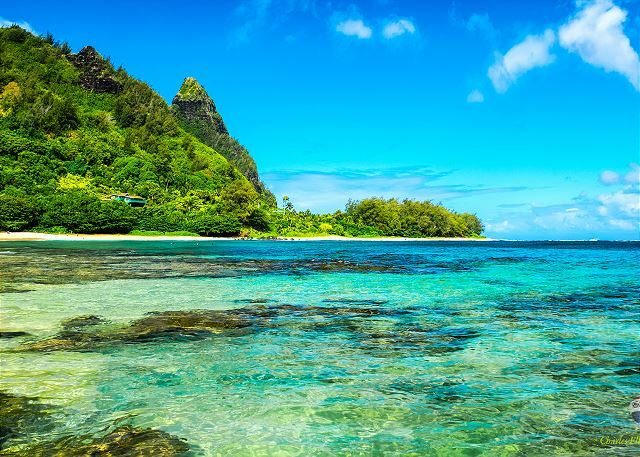 We were close enough to travel to the other side of the island, and it didn’t feel like too long of a trip, but Hanalei and Hanalei Bay were just right around the corner. Great access to shopping, surfing and snorkeling. We would definitely book this house again! The bedroom upstairs gets really hot, so two people slept on the floor downstairs during our stay, but the yard, proximity to accommodations and house itself made our stay great. First time to Kauai. Very happy with my choice to rent this home. Rental company was professional and the house was very clean. We thoroughly enjoyed staying in the beautiful Kauai Home. It was very nicely decorated and very comfortable. The neighborhood was really peaceful and quiet. I probably would have liked to see fewer geckos inside the house but I suppose that is part of the Kauai experience! Sherrie Orr who was our concierge was incredible and really helped by arranging fun family activities. Other than that the house was fantastic! Room to spread out at a great price. This house was so nice to stay at because of the space. The bedrooms are on opposite ends of the house so when our kids were up later, it didn't keep us up. My daughters were comfortable on the twin beds and we were very comfortable on the king. We appreciated that there were plenty of towels too. Make sure to grab a burger and sushi burrito at Kenji and to get shaved ice at tege tege which were wonderful and recommended to us by a local. Make the hike down to close by Hideaways for great snorkeling too. a guest from Del Mar, CA does not recommend this vacation rental. House clean, and well supplied . 1 queen bed in one bedroom and 2 twin beds in another bedroom and upper floor. the twin beds were VERY uncomfortable- poor mattresses,back hurt all week. This home was very accommodating. It had all of the things you would need in your everyday life big and small. My family was there when the huge thunderstorm hit and the house was well equipped with flashlights in every room bathrooms included. The garage has outdoor beach equipment that you will need for the beach bikes. We were very pleased with the thought that was put into this home for its guess. The Hale Kohea house was perfect for the five of us. 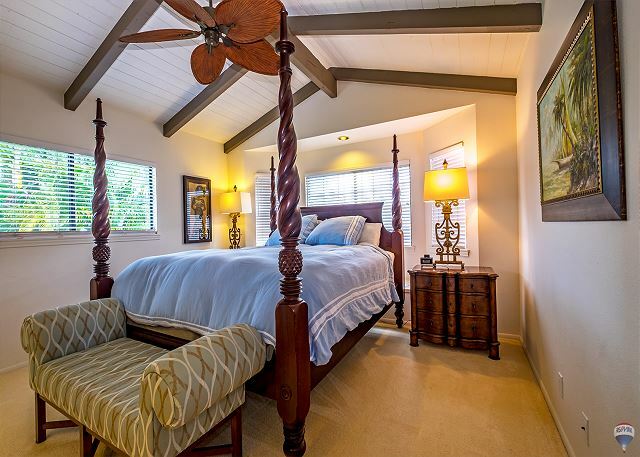 Nice bedrooms and bathrooms. The kitchen was fully stocked with most items needed to prepare meals.Very comfortable. The house was great! Clean, well equipped kitchen and spacious. Great location and good house in wonderful neighbourhood. Access to a local beach just a quarter of a mile away and overall great experience. A few small details that would have been nice to have had corrected. ie. No lock for the bikes, so couldn't really take them out. Overall not a huge deal, but details matter. Though master bed was super comfortable! Wonderful spot will rent again , and recommend everyone to stay. Enjoyed the home very much, met all expectations. Clean with all amenities, lovely lanai at the rear of the house. Re/Max staff very prompt and helpful, special thanks to Angela. Home was as discribed. However with no air conditioning when it was closed up home got very hot. Beautiful quiet place, nice sports equipment provided. One fan never worked...back bedroom always warm even with windows open and fans going. Backyard pond yucky...didn't circulate and there was a dead frog. Property management company was good about sending someone out for it. Nice about a late checkout too! I is a lovely house in a very quiet neighborhood, close to everything. Very clean and nice, good beds, huge TV, barbecue grill and even there bikes. 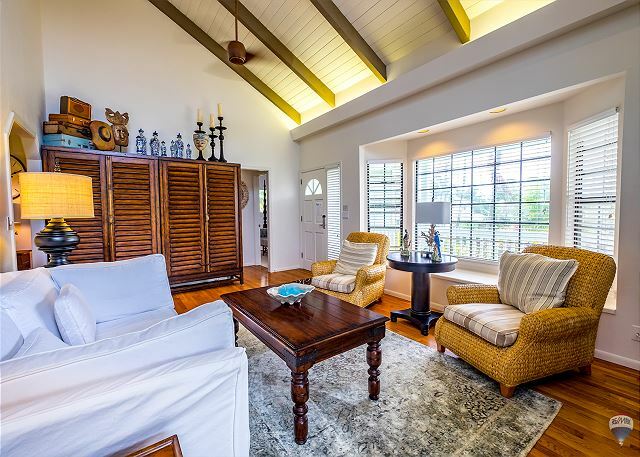 A very pleasant lanai with Kauai mountains in the back where you which you could stay longer. We would definitely recommend it. Great location on a quiet street close to everything. Hale Kohea was a brilliant home on a quiet street. The home was furnished well and the kitchen had everything that we needed. The neighborhood was quiet and close to everything. Hideaway beach was really close and was a highlight of the trip. The Hideaway restaurant was great as well. The house is honestly better in person than it looks in the pictures. If you stay here you MUST spend some time at Queens Bath and at Hideaway beach. As the crow flies they are both less than a mile from the house. I cannot fault the house or the view,my only complaint was the height of the master bed,it was so high that my wife could not get into it,so we ended up sleeping in the twin beds.could you please install a grip rail in the shower. Loved the home. Had just about everything we needed and more. Totally ruthless view of mountain out on back porch. My husband and I came to Kauai for our Honeymoon 3 years ago and wanted to share our lovely island with my parents for their 35th Anniversary! The Tommy Bahama provided a stay of perfection. They had everything possible to support a stay of perfection! We only wish we could have stayed longer. A lovely home in a quiet street. We loved the master bedroom and the well equipped kitchen. The kids loved picking avocados from the tree in the yard and we made good use of the bikes and the snorkeling gear. 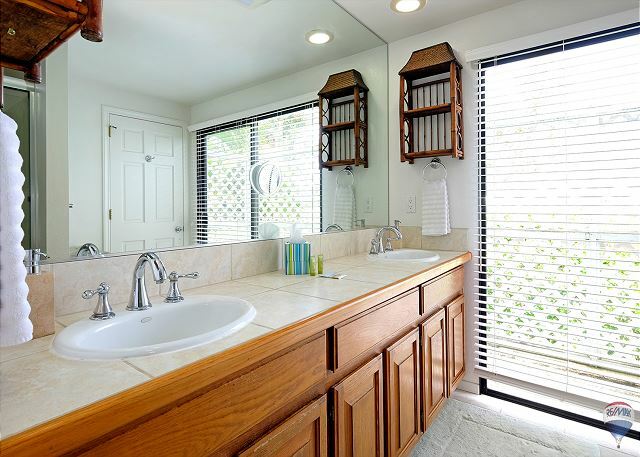 The home was very clean and had all the amenities listed. The master bed was like sleeping on a cloud - the most comfortable bed I have ever slept on! There was no DVD player, which would have been a plus. Remax was awesome to deal with, they were very professional. Lovely place! Would rent it again. peaceful and relaxing athmosphere - a house with very good vibriations and a "soul"
Very nice setting in Princeville with everything close by. My three sons surfed every day with board that rented from local surf shop. Eat dinner on the porch every night overlooking the beautiful back yard. Overall great experience would recommend to my friends. Lovely home, quiet sleep in a dramatic big bed. Car parked in the garage. Feed the birds in the back yard and head off for the bluff to see the whales. Added walking to the grocery store this trip. 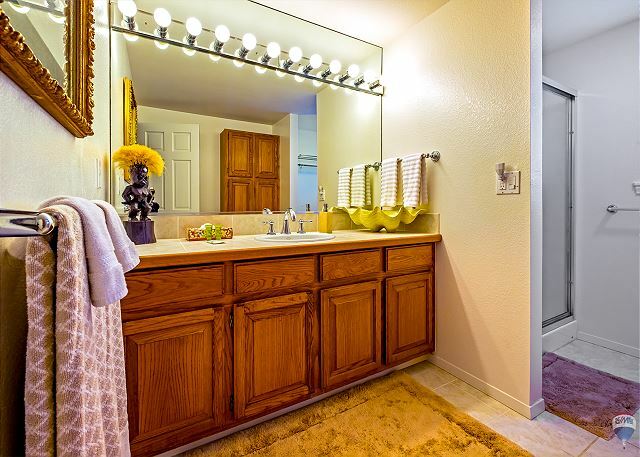 The owners keep this house well maintained and it has everything you need. Kind, nice people from start to finish involved with the rental of this beautiful home. Aloha! This was an ideal house for us, a couple looking for quiet. We needed a rest and we were able to recharge in the beautiful Tommy Bahama house. The kitchen is stocked with everything a gourmet would need to serve a gorgeous dinner on the very private lanai. Daily walks to nearby beaches and the bluff (we walked to the bluff 2x a day) where we were treated to dozens of whales jumping and tales in the air. The owners are excellent communicators with obvious care and attention to detail concerning their sophisticated retreat. one gripe i was continually told, the twin room downstairs was far too hot. we had to give one of the smaller fans upstairs to them. yet that made no difference. another larger fan or even better ac throughout would be best. i personally also think that that room would best be served as a double/queen bed as you already have the twin upstairs. def suit a young family's needs but very rare you'd need two twin rooms. my brother and his girlfriend had to sleep in separate beds. i also miscalculated the rooms, it says 3 bedrooms with a loft. i dont know if you noticed but you had two different photos of the master bedroom at different angles with different bedsheets. so i counted that as two with the two twins making it 4, i thought it was misleading in a way. but my family were very very happy with their stay and your service was prompt and very helpful. i wish you guys all the best. mahalo! a guest from Orem, UT does not recommend this vacation rental. It was a good value for the area and house was clean beautifully decorated. However, location was not described online and representative could barely give out even a fair description of its location, perhaps because of its out-of-the-way distance from most things. If we knew it was in Princeville (which we are familiar with), we would not have rented this place. House is not for families with toddlers not easily accessible to beach areas. Otherwise, is easy to work with in terms of booking and reserving. We were very pleased with the house, location and amenities, we had a wonderful stay in Princeville.